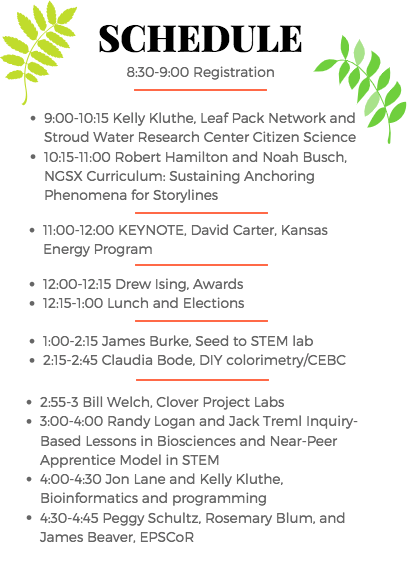 The 2018 fall professional development conference will be held at the KU Field Station’s Armitage Education Center from 9:00 AM to 5 PM on Saturday, September 22nd. 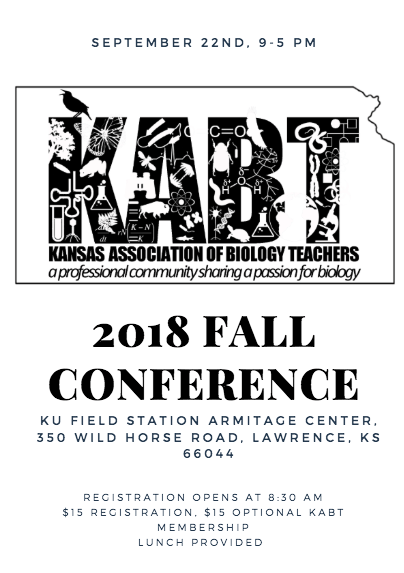 There is a $15 on-site registration fee and an optional year-long KABT membership for an additional $15. Yellow Sub sandwiches will be provided for lunch. Please view the attached flier for the schedule and contact sarahettenbach@gmail.com with any additional questions. Can you please send me information on possible presenter or exhibitor opportunities for this conference? Hi Laura! Thanks for the comment. Unfortunately the application window for presenters has closed for this event. Is there a way you would prefer to be contacted about presenting next year?